One of the three Irish histrioides x winogradowii hybrids, Iris histrioides x 'Finola' is lovely with white falls that have blue streaks. You already know of it's sister (or cousin?) the more infamous 'Katherine Hodgkin'. As much of the United States enjoys a bit of warm, spring-like weather ( record breaking 65 degrees here today! ), I still can't believe that it is already the end of February. Is it a cliche to say things like "where did this winter go?" or is it just a jinx-worth statement? Peas can be planted any day now if this keeps up, and although I love do love me a good, snowy winter, I think I'm good. If I tell you why I seem to have taken a few weeks off from writing you'll laugh. I am so self-conscious about my 'casual' or 'conversational' writing style, that I bought a writing program and signed up for an app called Grammarly that would help me. Over the past few weeks, I've written at least 10 posts, then saved them all as drafts - as I keep editing, and editing, and editing and editing, and then re-writing. I somehow lost my timing. The result is that I lost my momentum - my natural rhythm which was quite simple. Taking pictures and writing that just followed whatever the pictures required. I know that it can seem random, and I had some concerns that after ten years things begin to repeat, but the truth is, each year is different in some way, as most who garden, know. 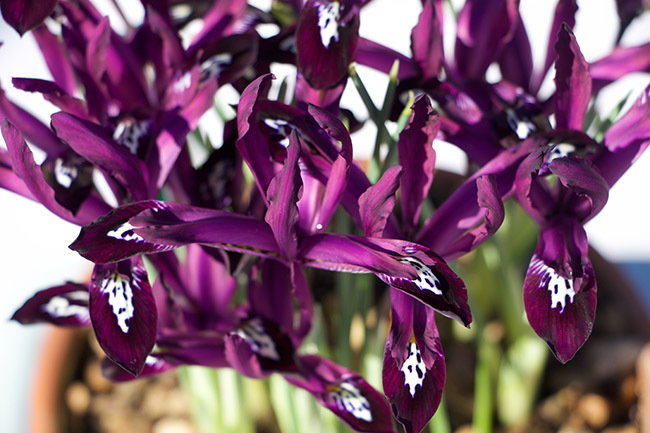 Iris reticulata 'Pauline', a nice rich, dark purple with thinner falls, but plenty of open flowers. To achieve this effect, I set as many bulbs as I can in a 4 inch plastic pot. 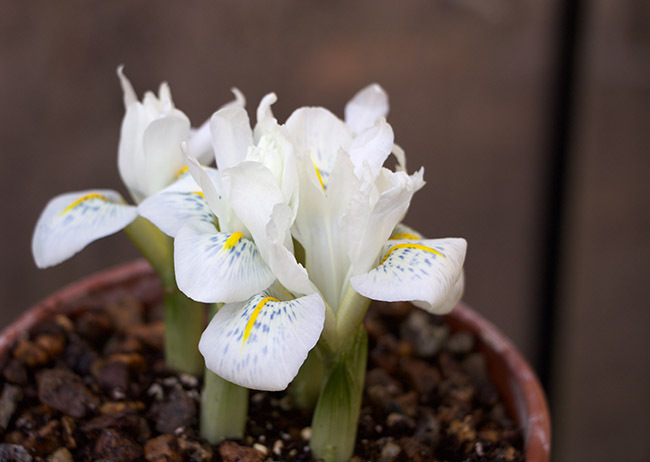 The bulbs root in the cold, dark space under the rear benches in the greenhouse, and by mid January, they begin to sprout. So easy. Remember all of those Dutch bulbs that I potted up and stashed under the greenhouse benches last October? Well, they are all blooming. It's funny (or sad?) that as we grow older, time passes much for quickly, for October seemed as if it was yesterday. That phenomenon does have me investing more in things like forced bulbs which seemed to take forever when I was a 12 year old, and often became discouraging. 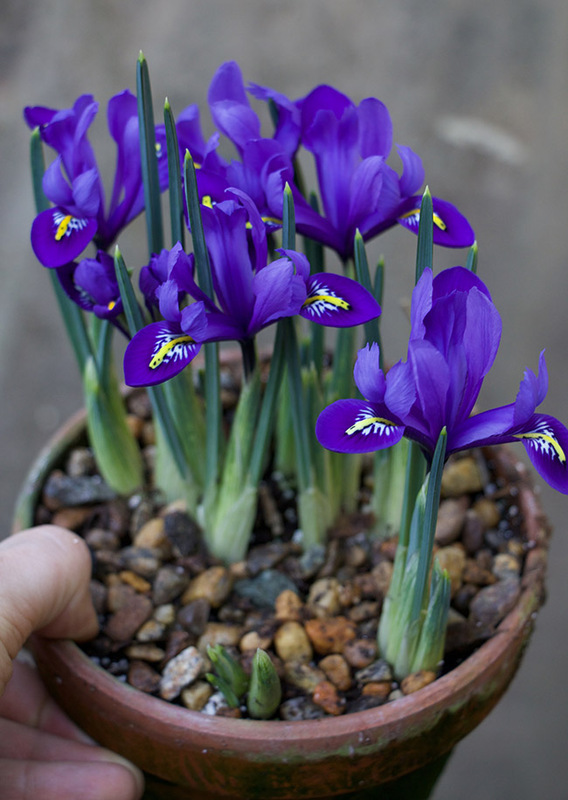 Iris reticulata 'Harmony' is a rich violet with the most classic if to cliche of falls - the sort that kindergarteners draw with crayons when ever they are asked to draw an Iris reticulata. (well, hey - at least, the sort I drew!). Here in New England, weather February can be fickle. OK, it can be fickle most any month of the year, but one notices such difference on those fringe months. 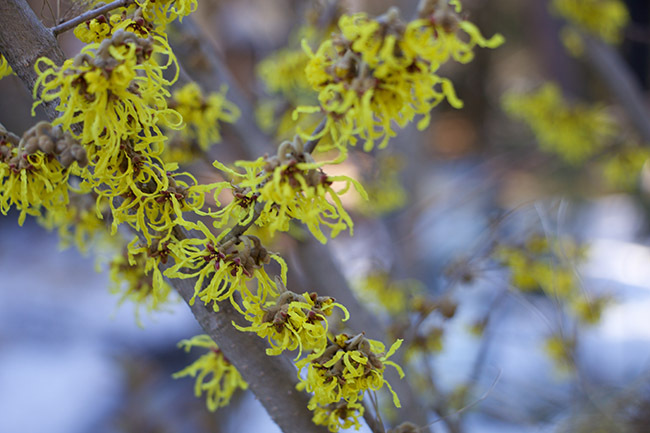 February can keep us deep under 5 feet of snow (as in the past two years) with witch hazels waiting to bloom until March or even April, or they can burst into bloom during the first week of February. Hamamelis x 'Arnold's Promise' nearly fully open before the end of February. It's our 'groundhog', and a reliable sign that spring is near. This year, I would say that it's pretty average, as our Hamamelis x 'Arnold's Promise' has unfurled its golden threads today, and since it is nearly the end of February, the 65 degree. F temperature (even with a foot of snow still on the ground) is welcome. 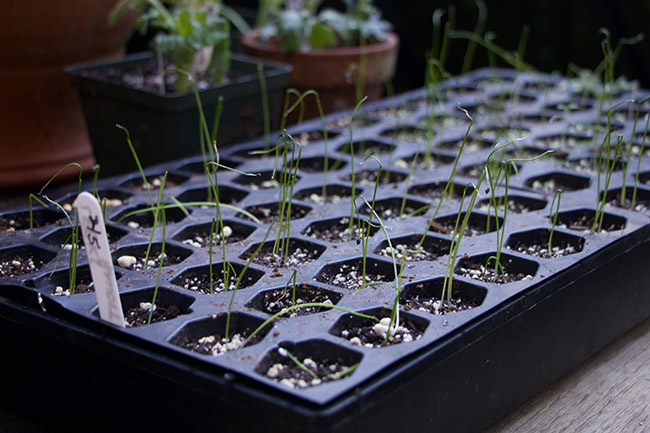 Another sure sign of spring - Leek and onion seedlings in the greenhouse! I am using cell trays this year to avoid transplanting and damaging roots. It's funny how the Lachenalia behave differently from year to year. Maybe I started them off later than I usually do, but then again, this pot I never repotted, and I may have not divided it for three years now. Usually these bloom in January but it looks like a big March display is lining up in the Lachenalia department! Usually the hybrid lachenalia bloom earlier as well, but this year, the species (these are all aloides - group) look as if they are a bit earlier than all the rest, but they all should share some bloom time on the benches. 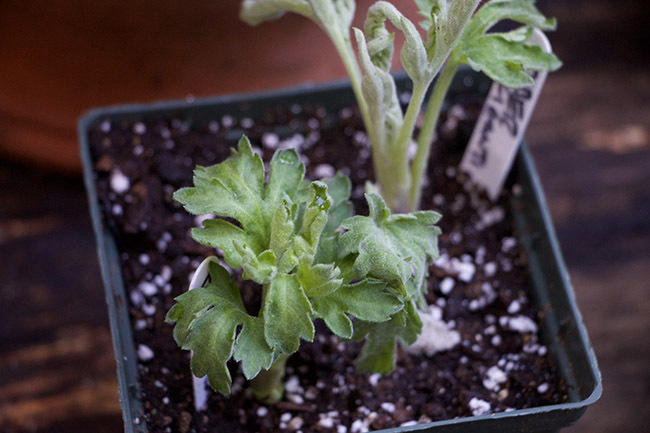 In the greenhouse the Chrysanthemums from just a few months ago, have all dried back a bit, having been cut back to stumps and set under the benches, but even kept dryish and cold - near freezing, new growth has emerged. There is hardly an 18th century gardening book that doesn't advise the gardener to 'strike cuttings' starting in January of each chrysanthemum variety. Im only growing a few this year, but here I am, taking cuttings of a few more than "just a few". Stop me. 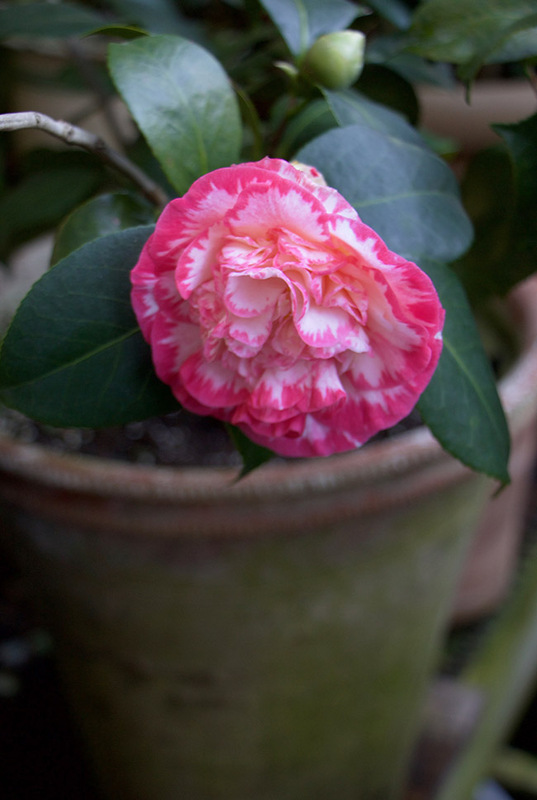 Oh 'Margaret Davis', you are indeed the queen of the Camellia world. If you were a Dahlia, you would be 'A.C. Ben.' (meaning that you are always a crowd pleaser and a good doer. And you win all the shows.). 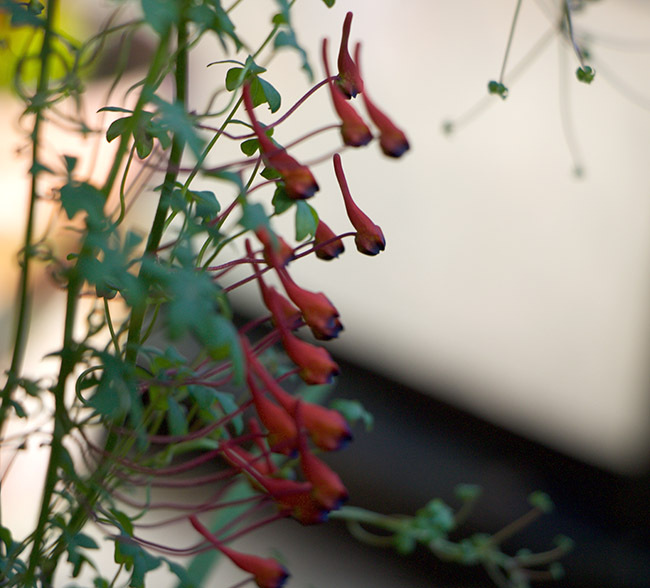 This may be Tropaeolum brachyceras, or a cross. It's another tuberous form from the Andes that a reader sent me but I the flowers are still immature. In a few weeks with the brighter sun, these should open more. The first blossoms on another tuberous Tropaeolum, T. tricolor are also starting to show color. If it stays this warm it should put on a great show in a few days, but one must be careful with all tuberous winter blooming tropes, because any day over 55 deg. F discourages their growth, and could potentially trigger them to believe that their hot, dry dormancy period has arrived prematurely. I sometimes set these pots on the cool gravel outside on sunny winter days. I feel as if I repeat this sequence of blooming plants year after year! But here you go. 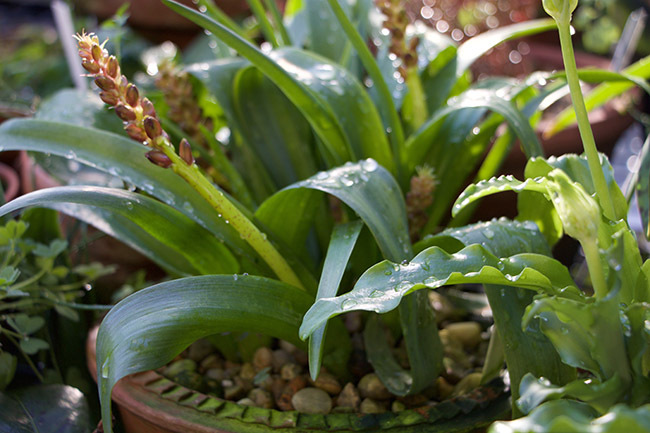 The darling and sweetest of all of the Ornithogalums - the alpine house favorite O. fimbriatum. Low, tiny and it blooms for a long time. Since all timing is off throughout the small world within my greenhouse, this lonely typicaly early-winter blooming Nerine undulata had presented us a half dozen stems. 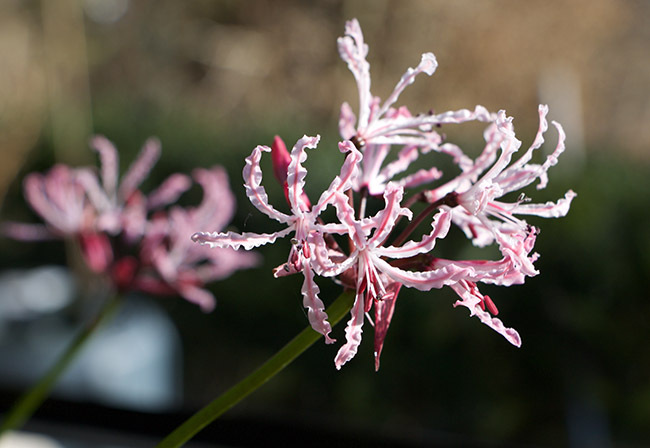 I now believe that this deserves the 'Best Nerine Ever' award. Much more reliable as a pot plant in a cool greenhouse than it's fussier sisters (the showier, yet crankier N. sarniensis group). Our rescue dog 'Bob' came to stay here from France- he needs a good home! And now for something different. In December we received a rescue dog from France, who came to stay with us while being evaluated at Tufts University to see if they could restore this sweet four year old Wire Hair Fox Terrier and French Griffon (clearly, more Griffon). He was separated from his litter mates in France as a puppy when his breeders, who was breeding hunting dogs discovered that he was blond. HI as discovered by a team of dog rescue folks from France and the Mid West, who sponsored his trip here. 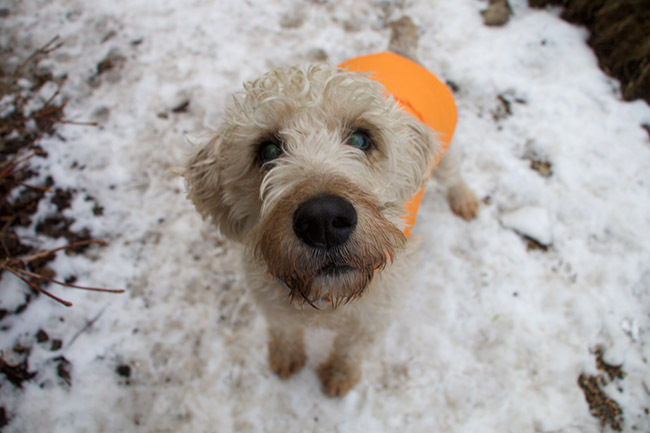 They asked us to help and we welcomed the chance as they helped us once with an Irish Terrier rescue. Why he was named "Bob" in France, I have no idea. We do call him 'Robert' more than we do Bob, tough. I you know of anyone worthy of such a sweet rescue, contact me and I can put you in touch with the folks here in the Mid West who are setting up his placement. 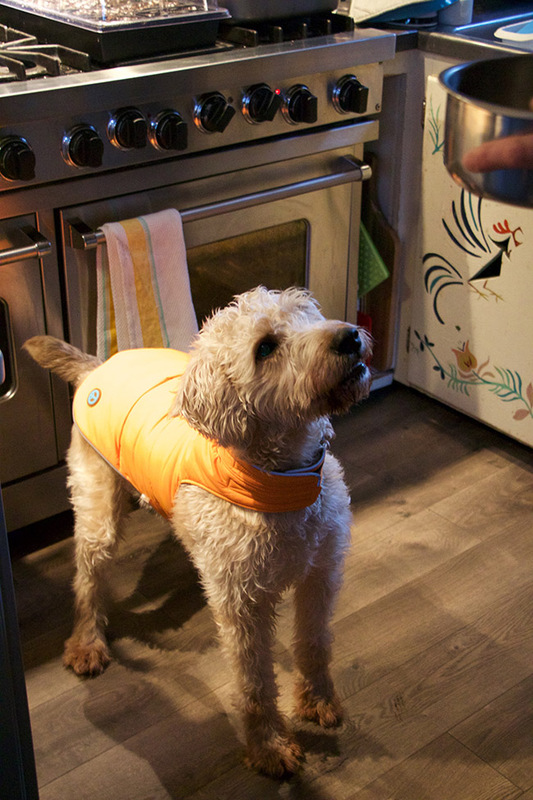 For a blind dog (who is now officially blind, the vets found his eyesight un-restorable), he is smart, learns and maps out the house and yard quickly (just don't move furniture around as we did once!). He is bigger than you might think, but his fur is so soft, and he is a real sweetie. All he wants to do is to sit on the sofa or on the chair with you and cuddle. Oh, and he likes to eat, but then again, he is French! It's fascinating to see how quickly a blind dog can map out his territory. He seems to be able to count stairs, he learned where the doggy door was in a couple of hours (ok, sometimes he misses it by a few inches!) but then gets it straight. He needs a good home. In France, he was shaved so he doesn't have his Griffon-coat, which would make him look like that very on-trend dog breed that we see often in TV commercials. Is he really part Wire Hair Fox Terrier? Hey, I don't see it, except maybe in is coloring, but who cares when he is this cute. If anyone is attending the 36th Annual Connecticut Flower and Garden Show this Sunday, come see me speak at the Garden Conservancy Seminar at 2:00 PM. I'll be speaking about Rediscovering Summer Blooming Bulbs. The sheer number of bloggers and social media posts with clever advice on how to start your seeds indoors it can be difficult to find the proper method. My advice is to first, do some fact checking. Regardless if one is a new or an experienced gardener starting garden plants from seeds is simply one of the greatest winter and spring pleasures. I am focusing on easier garden plants for this post - vegetables, annuals and a few perennials that are easy. Seed starting indoors is one of the few gardening tasks which is truly enjoyable (unless you are a wholesale grower who had thousands to transplant!). I get it. Seed starting for you or your family can be a fun family event, so take my comments and advice with a grain of salt. Think of it this way: You can find a food blog that focuses on making pretty cupcakes or creating entire meals in Mason Jars,. It's fun and somehow therapeutic. I don't intend to dismiss your joy or starting sunflower seeds in empty egg shells. Go for it. But that's not what this blog is all about, let's leave the craftier side of seed starting for Instagram. Some of you may wish to move forward, to elevate the bar a bit more on what you can grow, to grow it well, and to learn more along the way. The big message here is simple: Do some research first. A good site is Tom Clothier's chart here, which shows you how temperature can affect your seed starting success. For example, note Lettuce - I will advise you to not sow your lettuce under lights indoors where it is warm, because lettuce prefers to grow in cool soil, and it will germinate in cool soil. Here's where it can get confusing, though, For example, I will advise you to sow lettuce seed outdoors, in late winter or early spring, directly into cold soil because lettuce seed can handle low, freezing temperatures - near 32 deg. F. IT will germinate at the right time, don't worry. But you will need to take into consideration the time - for it will take much longer to germinate at this cold temperature. You will still see near 98% germination rate but after 49 days. At cold temps, it takes longer for the seed to germinate. Now, indoors, you will see photos on blogs of folks starting their lettuce under lights, and you'll see fast germination there - near 99% in fact - so you might be saying -"Hey Matt, my lettuce germinating just fine if not better under lights? What gives?) It's true - you caught me - the truth is that germination rate for lettuce is far better (well, 99% vs. %98) indoors. What few sources will explain to you is that although lettuce will germinate under lights quicker and better, the seedlings will not grow well under lights, becoming leggy and long vs those grown under natural light in the garden or in a cold single-pane glass greenhouse. Your seedlings raised indoors will be handicapped. Now, lettuce is such a fast crop, that you could sow seed outdoors later in the spring, and divide and transplant seedlings - something you can do throughout the summer, but if you are trying to get an earlier crop, the best way would be to sow your seed into cold ground, or in pots set on a cold but bright porch, The goal here is to achieve dense growth, which can only be ensured with bright sunshine and cool temperatures. Dont bother to start lettuce indoors early just because you see seedlings at nurseries in the spring - remember, those are probably raised in a cold greenhouse or a warm one with full sunshine. There are many seeds though that I encourage you to start early indoors. 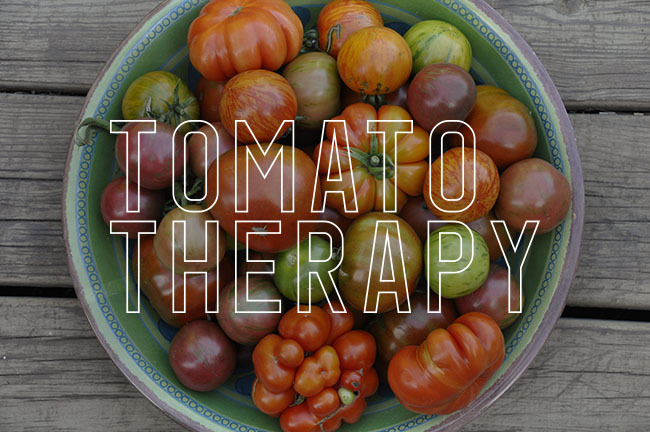 Peppers, tomatoes, eggplant are just a few. Here are a few of my favorite sources. Just be sure that your source is valid. I use a few books, by default I go to the Johnny's Selected Seeds website, find a vegetable or flower seed description, and scroll down to GROWING INFORMATION. Generally, you will find everything you need to know here. I do recommend Tom Clothier's page here - it has a fine chart that explains the temperature ideals for many vegetable seeds, but it doesn't explain about the quality of the growth achieved as this depends on many factors - indoors, vs. footcandles, sunshine vs. overcast days, plastic greenhouses vs. glass. Lighting units are rarely bright enough for most seedlings. I also highly recomend my friend Margaret Roach's site A Way to Garden. (her seed starting information is here), but you can find stories and tales throughout her site. She is such a great writer and storyteller, that one can forget that everything is very well researched. Margaret often goes right to the source for her information but she grows many plants herself. For books I rely ever season on the late Wayne Winterrowd's out-of-print book Annuals and Tender Plants for North American Gardens. It's difficult to find now, and I am in a bit of a panic as my copy was chewed to death by puppies last year, losing it's binding. It's a thick and heavy hardcover, not unlike a bible, which ironically, it is for seed starters. Focusing on annuals and tender garden plants, it is invaluable for learning not only how to raise such obscurities as Salpiglossis and Nemesia, it also provides a literate history for each one as well. 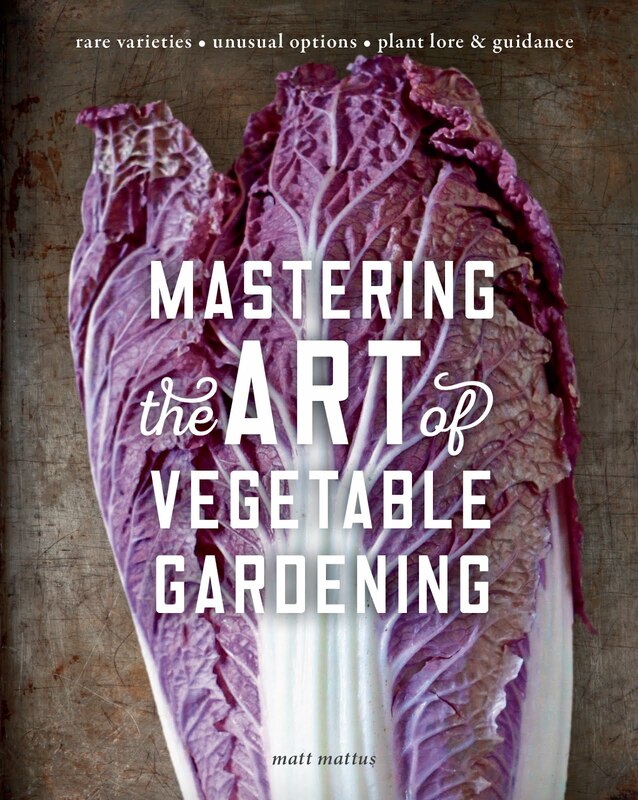 For vegetable growing, I can confindently recommend every book written by Dr. Amy Goldman. Focused on tomatoes ( The Heirloom Tomato ), Squash, (The Compleat Squash) or Melons (Melons for the Passionate Gardener), each book is beautifully designed and written, with well researched details about each variety. I promise you that each book will end up by your bedside often, and if you are like me, loaded up with post-it notes! I welcome your suggestions as well. Hey, I've been guilty of it too. I know how it goes. 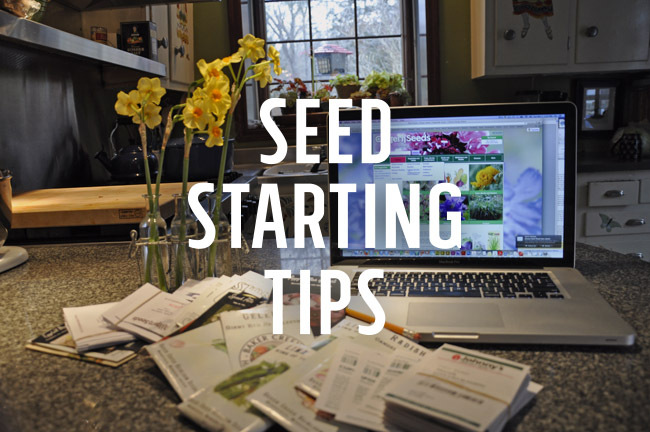 You have a stack of seed packets, and after a while, you're just tearing them open, counting out seeds and making little holes with a pencil and dropping in a seed, covering it up, watering the flat or pot and setting it somewhere warm. We often discover the problem here much later, either when some seeds never seem to germinate or grow, or most likely when we pass by a tray of robust, stocky seedlings at a garden center and we think to ourselves "now why don't our seedlings look like those?" We all usually end up buying a few flats of 'healthier' snapdragons or peppers to augment our home-grown pathetic plants. No one will know if I still bought a couple of six packs of lettuce that looks denser and larger than my stretched out seedlings. And this is where raising seedlings becomes a bit like baking. Following the recipe precisely will ensure that you achieve better results. Baking, as well as seed starting is a science. 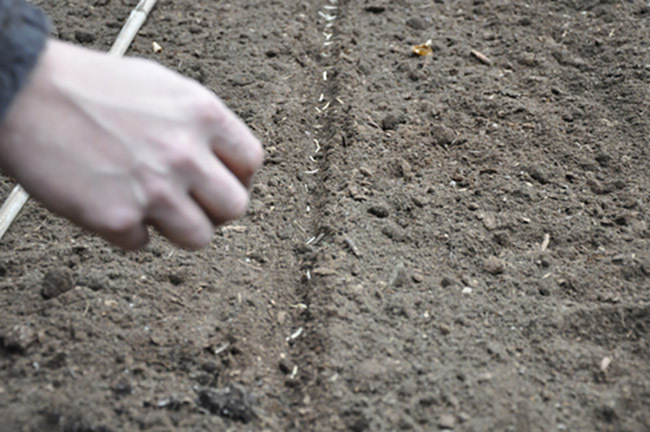 • Note the ideal time to sow (either the number of weeks before one's frost-free date, or when to direct sow outdoors). It's true that many of us start our tomato seed too early indoors, yet most of us still do it. I should admit that although I know that a tomato seed sown directly into the garden may mature nearly at the same rate as a strong seedling does, but I also shoudl admit that I sowed a few seeds last week (but remember, I have a greenhouse, and I am experimenting). • Pay attention to temperature requirements - It's not always what you think. It's not uncommon for seeds of certain plants to require different treatments. Some need warmth, others are best when planted in cold or cool soil which aids in their germination. Do you know the ideal soil temperature for the seeds you are starting indoors? From what I am reading on some blogs, some people dont'. While you might imagine that tomatoes, peppers, cabbage, kale and lettuce all might enjoy spending some time under lights on a heating mat, the truth may surprise you. (hint: Two of these require hotter temperatures to germinate,and the answer isnt tomatoes. Some of these demand cold weather to germinate, and the answer isnt Kale or Cabbage.). Here are a few of my personal tips which I have learned over the years. How I organize my seeds for the year. First, I separate the seed packets into two broad categories. 2. Those requiring an early start indoors. Then, I research each variety. I look for planting time, dates to set out into the garden, and other cultivation tips that might be helpful. I write these tips in pencil or Sharpie marker right onto the seed packet. (Usually I only write the temperature needs for germinating period, and for growing on. I also note the date I should sow the seed, and any other tips which I might forget such as exposure to light, or the risks associated with day length. The Direct Sow pile requires additional organization, as some will need to be ready to sow as soon as the snow melts, and others later once the soil have warmed up. Cool weather seeds that require direct sowing include lettuce, carrots, and annual poppies. 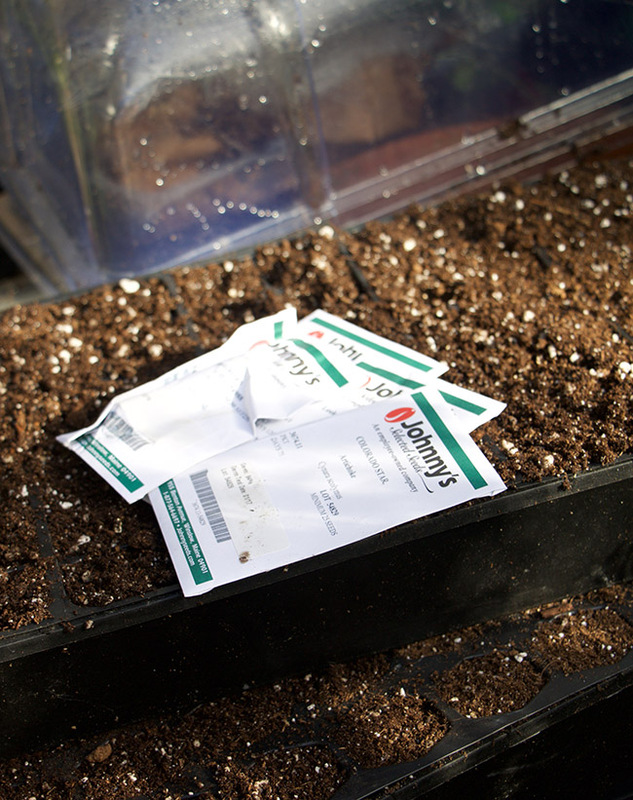 Mid-spring, I may choose to sow varieties that don't mind moderatle cool soil, but will take off once it gets warm. OFten these are annuals which dispise and root disturbance, so they cannot be transplanted. Amaranth, nicotiana and other fine seeded annuals fall into this category. Later, the third pile contians the warm weather summer crops, mostly vegetables - those plants which reuire the warmest temperatures in which to germinate. You know these already. Cucumbers, string beans, gourds, squash, zucchini, basil. TIP: I do cheat sometimes with this later group. I have found that I have better control if I sow even the larger-seeded easy-to-grow summer seeds in containers (outside, in a protected spot - I use my dining table on the deck), were I can set out pots of squash and cucumber seeds which I have sown into individual cell trays set in full sun. Thus, beginning them only a couple of weeks before I plan to set them out into the garden. This is a more challenging list, and one which is often generalized, but techniques here are anything but general. Tomatoes and peppers are the easiest to start, as they enjoy warm soil and warm air while growing, but kale, cabbage, and broccoli are more challenging as they demand much warmer germination temperatures with soil near 80 degrees, yet they grow best with much cooler growing conditions after they germinate. A challenge for anyone raising plants under lights for these plants can grow leggy very quickly if kept warm. Early cabbage and Kale seedlings, started under lights until they germinate, but then are moved outdoors where they enjoy cold weather. Notice how short these seedlings are vs. many that are posted on social media which are raised under lights. You can achieve this indoors, if you expose your seedlings to full sunshine on mild days. 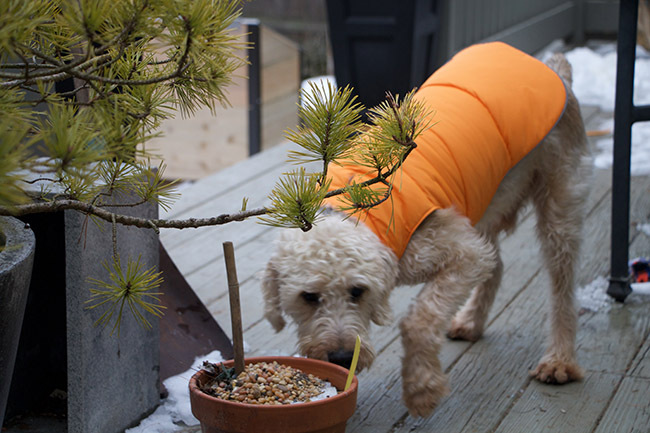 Bring them out onto the deck and bring them in when temperatures drop near freezing (and yes - a coldframe would suffice, too!). TIP: Kale and in fact, the entire cabbage family should be started slightly later (around April 1) in warm 75 -80 deg. 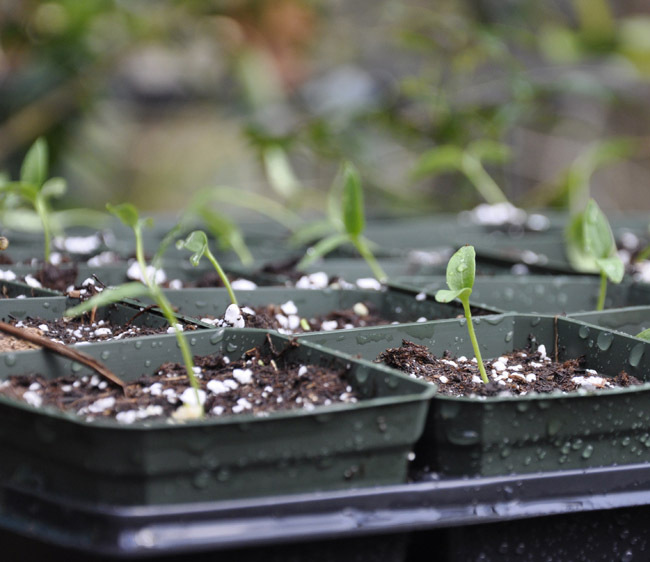 F temps underlights for a few days, but one can still get sturdy, robust seedlings by sowing seed in pots a bit later. It does take some work, as the more time they spend outdoors, the better. You will just need to bring them in when the weather shifts near freezing as one must never allowing them to drop below 33 degrees while young. 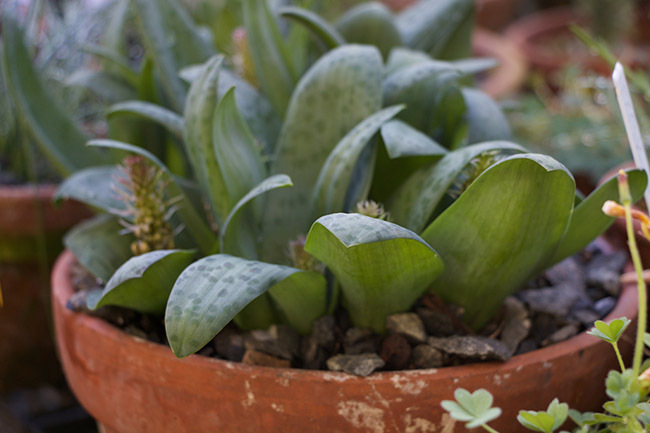 If one is lucky, sturdy, stocky plants can be achieved by May 15 which can be slipped into spring soil without the risk of them being rootbound, a terrible common trait with store-bought seedlings, and something that will impact maturity. It's rare to find a well-grown cole plant at retail, as it would need to be small, and not grown aside petunias and tomatoes. This past weekend I began sowing my seeds again, beginning with a red artichoke 'Colorado Star', lisianthus and some tall dianthus cut flowers are the first seeds I am sowing this winter. Grow those plants that you cannot buy. As garden consumers, we can do better and train retailers a bit, for we can't blame them completely, they have shareholders and need to show profits. It's business. If we will buy it, they will sell it, and with spring plants, often who offers them first, wins. 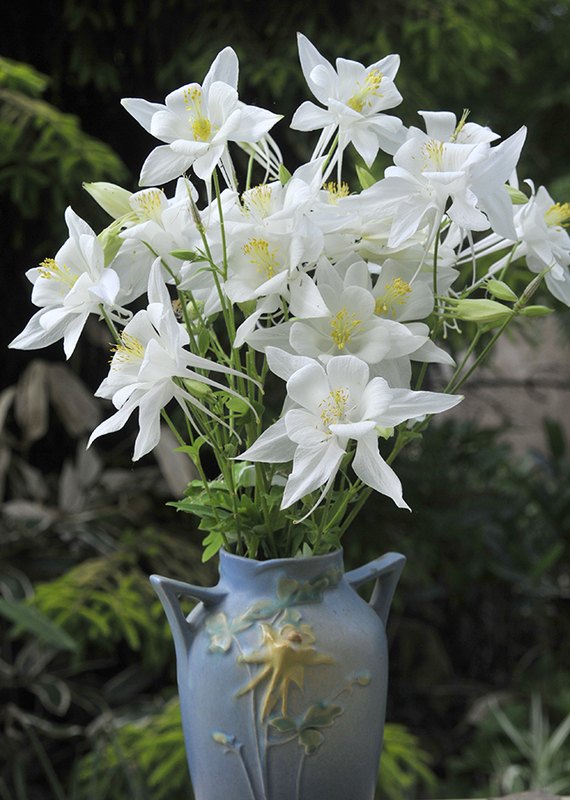 No longer is about selection and 'proper size' as much as it is, who has plants in bloom. But if I want Asarina vines or a bed of tall annual poppies? Then I need to order the freshest seed possible and take the time to sow it properly in late February or March directly where I want them to grow. It takes a bit of time, some work and some skill, but I not only like that part of gardening, I really enjoy the results which can be rather impressive. Really unusual annuals like these native Cuphea viscosissima must be started early in the greenhouse, and then transplanted carefully into 3-inch pots so that one can transplant them with little root disturbance. The deep purple blossoms are like clouds of butterflies, and a favorite of many species of butterflies, as well as bees. But this will all require tremendous change across platforms. Buyers, in particular, will need to be convinced, then packaging may need to change, as well as how plants are merchandised. Ultimately sales at retail will need to demonstrate that there is an interest in more unusual plants. Maybe one day, there will be deep root trainer pots of English Sweet Peas for sale at garden centers as they are in England, or root cuttings of Sea Kale sold in bundles as asparagus roots are sold, but we Americans need to grow a bit before we can handle such specialties. Until then, we home growers are left to a plethora of choices, the seduction of endless varieties of heirloom tomatoes, old fashioned squashes, vintage flowers and many new varieties not yet available in the quantities practical for retail. Long season root vegetables such as carrots, oyster root (here) and parsnips must be sown directly where they are to grow.One wants long, straight roots, and those will never form well unless one allows them to naturally form a taproot. As for seed raising at home, my best advice to you is to raise what you cannot buy grown well. You may lean toward pretty heirloom tomatoes and peppers, or old-fashioned cottage garden flowers, but make your choices worthwhile in some way. Personally, I enjoy the challenges that come with more difficult-to-grow seeds. Yet, at that, I am far from accomplished with many of them - I still with the harder alpines and ephemerals such as trillium and hepatica, yet with each year, I am learning much. Last year I was able to germinate and grow-on a crop of Blue Himalayan Poppies and some Cardiocrinum lilies (not that I can even grow them outdoors where I live - it gets far too hot and humid for blue poppies here, and our winter temperatures are too fierce for large stands of Cardiocrinum.). Annual poppies such as the Shirley Poppies are lovely, but rarely seen in any garden. As they must never be sold in a 6 pack, as they will sulk, one would need to direct sow them. Never to be transplanted, just some gentle thinning is required. 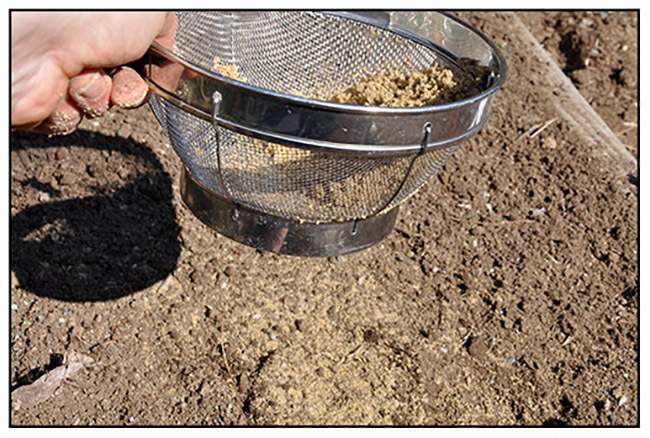 Since they are burdened with minuscule seed which needs to be sown very early to ensure cool growing conditions, .the seed is mixed with sand and sifted over prepared beds to make any thinning of plants, easier. 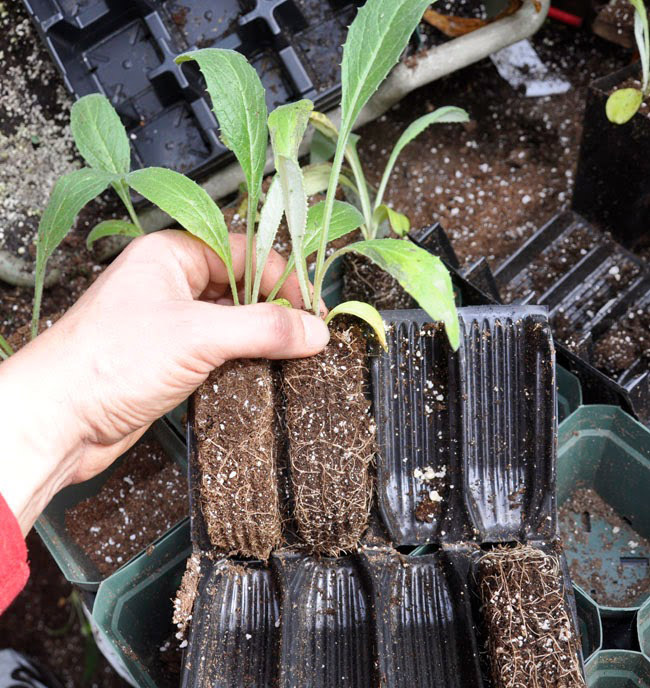 Artichoke seedlings must be started very early in New England which allows them to develop some size before subjecting them to 2 weeks of cool weather again before setting out into the garden. Two weeks of 40-50 degrees vernalizes seedlings and triggers them to form buds in their first year, and one is limited to growing annual crops in the North East. I begin my sowing lists early. (12-13 weeks before frost free date, and it's 13 weeks to May 5th. As Artichokes need a long season, especially in New England, one needs to fake two years of growth for this biennial. If sown early 18 -12 weeks before frost, one has time to chill the large seedlings outdoors while it is still cold out - (near 40 deg. 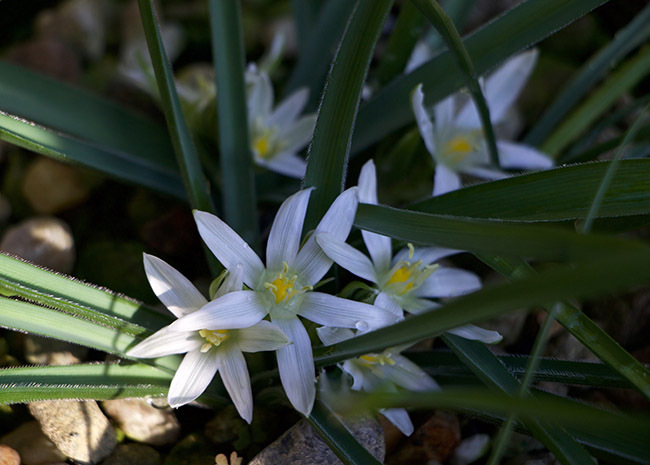 for 2 weeks which acts as a vernalization period) before setting them out into the garden. This trick stimulates the plants to bloom in their first season, and I can have full-sized artichokes in my New England garden as plants cannot winter over outdoors. Leeks appreciate a long growing season too, and though they can be started as early as the previous November under glass, I prefer to start mine in January. A greenhouse helps as the cooler temperatures are essential for stocky growth, under lights, one can raise seedlings earlier if the room can be kept cool at night. Sown into individual cell trays 8 -12 weeks before I can set them outdoors into deep holes. Feb. 11th , Summer onions are started, as well as parsley, celery and something called Parcel, a celery grown for its foliage which is like parsley. Each following weekend, a different list is sown all based upon the frost free date. Seeds continue to be ordered and come in the mail throughout February and March, no need to order everything at once. Near the end of February, I will sow peppers and cabbage, the peppers will need heat throughout their growing period, the cabbage family only to germinate, then out to the greenhouse. Seed raised columbine are easier if one buys pre-chilled seed such as these 'bird'' series from Jeletto seed in Germany. My go-to source for many perennial seeds. Make Note of Proper Seed depth, light/darkness and moisture. Some seeds need light to germinate, others - complete darkness. while some seeds such as those of salpiglossis need total darkness, yet be sown on the surface. 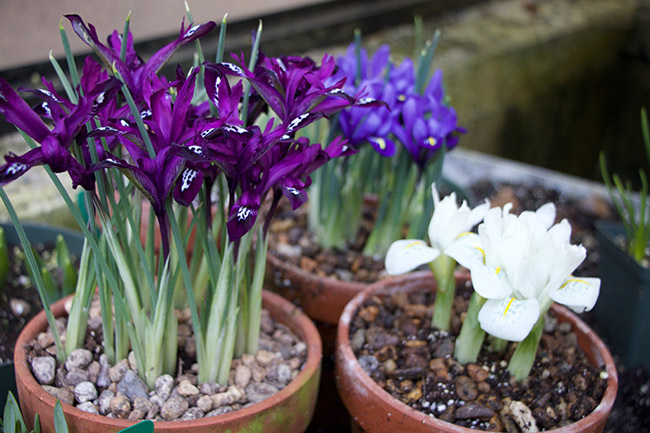 Bulbs like Leeks, (yes, they are a bulb) can be sown deeply - 1/4 to 1 inch is OK while others require daylight and would rather be pressed onto the surface, never covers. Cleome seed can be notoriously fussy - unless one realizes that they prefer oscillating temperatures (a difference between day and night temps near 10 deg. differential), but only a few plants demand that trick. Surface sown seeds of more challenging seeds like these primula require some stratification (cold, warm, then cool) temperatures. Eight weeks out in the snowy cold, and then brought into the greenhouse where there are dramatic shifts of temperatures from night till day, and grown cool. Some indoors sown seeds may need to be surface sown, (sprinkled lightly on the surface). Often these seeds are tiny. Others may require careful treatment, such as Lisianthus which have exacting temperature needs and day-length requirements to keep them on track. A snapdragon seedling being transplanted. Some seedlings can handle root disturbance better than others. Temperature is often generalized when germinating seeds and in growing on. Not all seeds need a heating mat, so always check first, and see when and if a seed needs bottom heat. Lettuce, for example, hates bottom heat and germinates best in cold soil. Some veggies such as cabbage which is often touted as a 'cold weather crop' has that odd need for hot soil temperature near 80 degrees to germinate. In fact, all of the plants in the cabbage family need heat to germinate well, and to produce strong roots on the first couple of day. 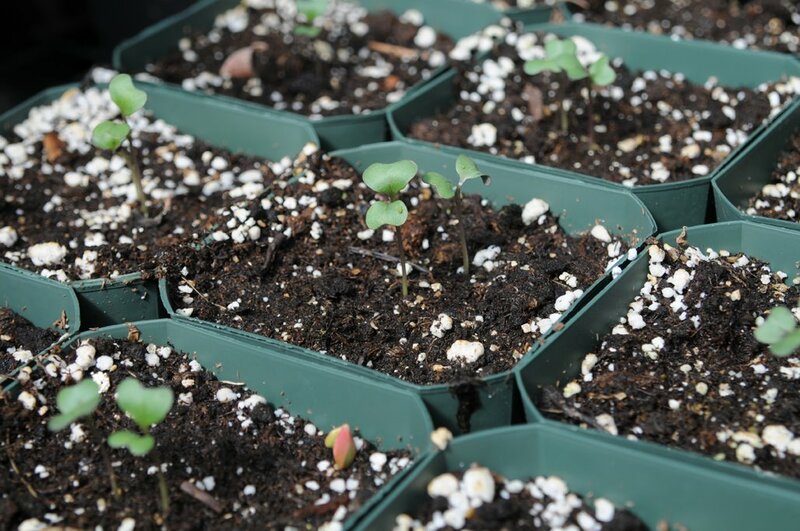 After that, you must move them to a cold room with the brightest light possible or your seedlings will tower to 2 or 3 inches tall with just the cotyledons. Disaster will be inevitable. Start your kale and broccoli outdoors in pots for better results, as I mentioned earlier. 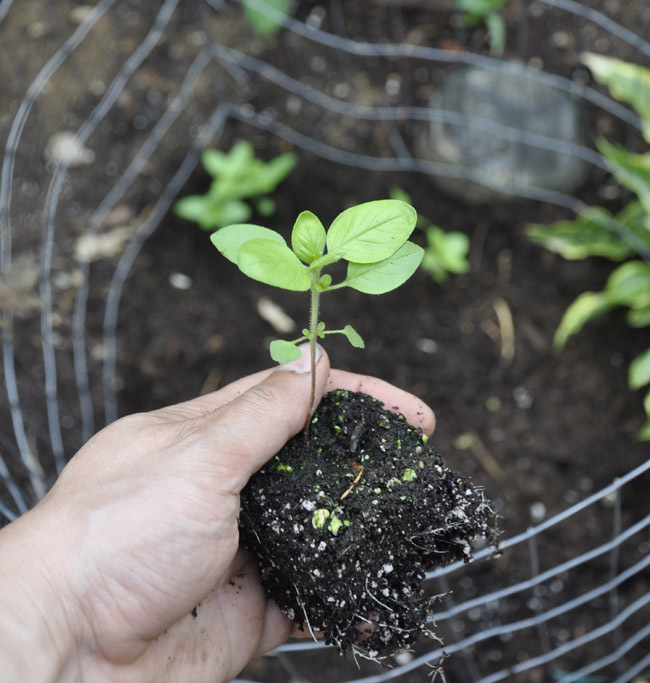 Only a few weeks before setting into the garden will be needed, but with full-sun of mid-May and good fertilizer, your seedlings will be short, stocky and healthier. If there is a go-to source for the best advice for seed temperature I say that it is still the Johnny's Selected Seed's website. Trust those who actually grow many of their seeds vs. those seed companies that buy seed grown elsewhere. Peppers sown in February must be grown warm and with bright light. Never to be set out in to the garden until the soil temperatures reach 55 deg. or higher. 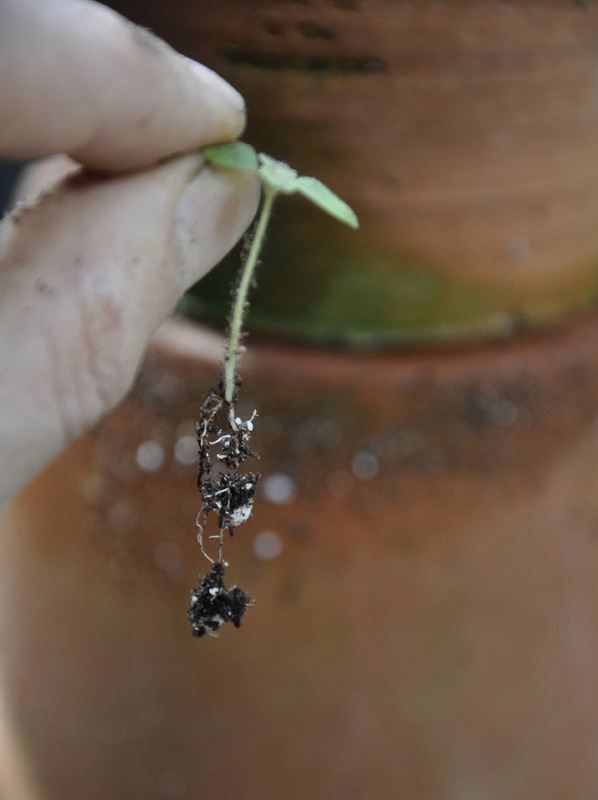 Moisture consistency is often key in germinating, it's true, but once plants emerge, some seedlings grow better with air circulation, if not - most do. To avoid those nasty gnats and soil slime, allow teh surface of the soil to dry out a bit. Never use cinnamon or other homeopathic remedies here. 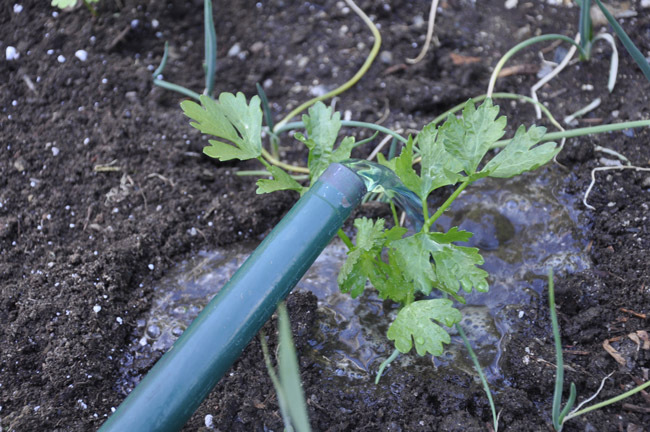 Best to remove the layer carefully, replace with fresh soil and allow to dry between waterings. In a greenhouse, water and moisture is less of a problem, as air is moving freely, and with the addition of a fan (which helps make the seedlings grow stronger), if one waters in the morning on at mid-day, there is less of a chance that botrytis can establish itself, and damping off is less of a problem. A fan isnt a bad idea indoors, as well. 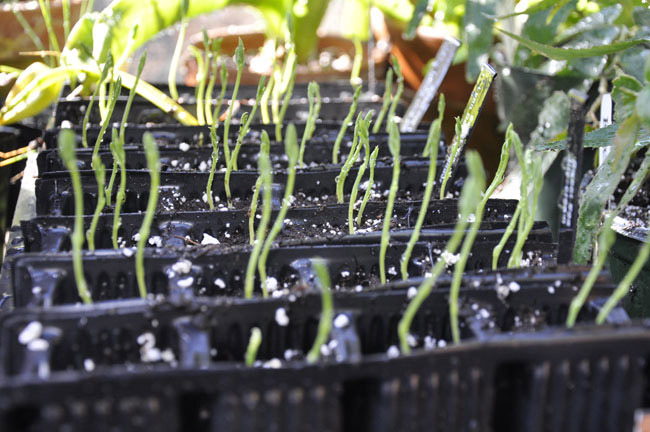 Sweet pea seedlings get bottom heat for just a week until the germinate, then they are relocated to the cool greenhouse. My tip for raising award-winning Broccoli and Cauliflower? It's easy. Sow broccoli and cauliflower much later in spring - mid-April or even late May into individual 3 inch pots. 2 or 3 seeds per pot, then yank the weakest one. Keep them outside, and in full sun (on your deck for example). Grown this way, the seeds will germinate in just a few days and be large enough to set out into the garden by the third week of June. Fertilize once or twice with a balanced 10 10 10 fertilizer, and your plants will look farm-stand quality compared to the sickly pot-bound ones at the garden center. Just as the root tips reach the sides of the pots, you can carefully slide them out and into prepared holes in the garden. For awesome kale, start slightly earlier, perhaps germinating indoors in late March or early April (6-8 weeks earlier) than move outside gradually on milder days in April and May. Sow your fall crop in Late May (and for dinosaur Kale, plan on a fall crop rather than a spring crop). They will look nothing like the sad plants one sees at the nursery either. Those will be root bound, and will hardly mature into healthy plants. You would be so surprised at how large and strong these plants will grow compared to those bought at a garden center in cell packs, which are often root bound and will never achieve a great size. Sown in late spring, many plants catch up to nursery-grown stock and outperform them. Not to mention that many commercial growers treat their entire crop with growth retardants to make them appear healthier, with thick, green stocky stems and dense growth. 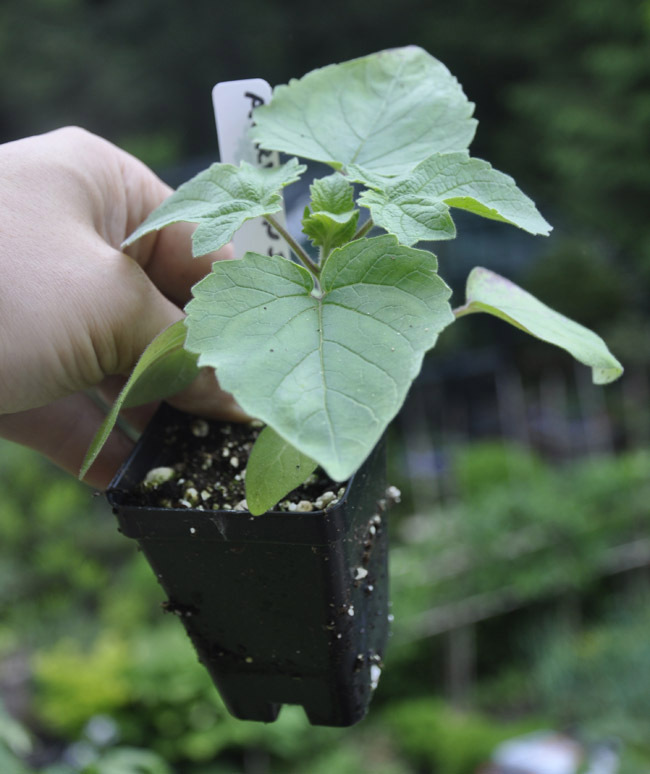 More challenging annuals require care such as clean, sterile soil and deep pots if you want to get seedling like this. Often not found at garden centers, more unusual annuals must be raised from seed at home, but nothing is better than having a bed of things others can only dream of. Novelty seed starting methods are not always the best choice. The Internet is full of novelty ideas for starting seeds. 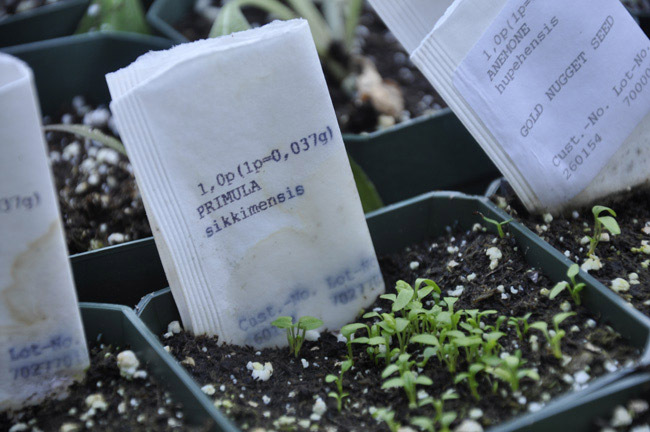 While most seeds will germinate on a damp paper towel, few horticulturists or serious plantsmen would ever suggest doing it. It is simply not good horticultural practice and belongs on mommy blogs along with egg shells, Epsom salts, and cinnamon. 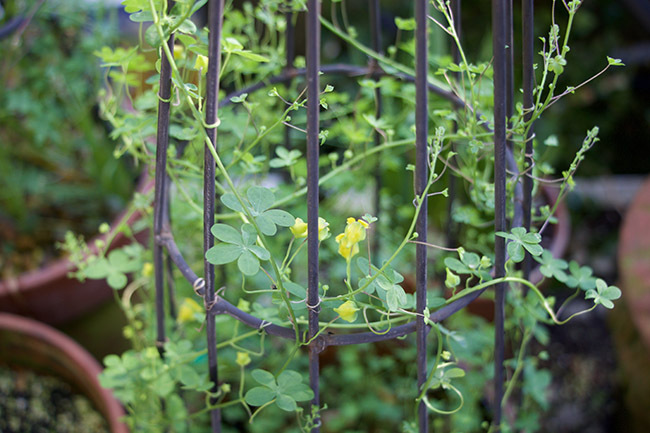 Save these for fund kids' science projects, but not for your garden plants. Containers are up to you, and while I don't mind investing in new, clear square pots, root trainer deep pots and seed flats each year, (sterile, consistent size), you are on your own here. You might want to try those newspaper pots but not for plants which may require a longer season indoors as they tend to fall apart (and besides, who has newspaper anymore?). It's up to you whether you want to repurpose or not, just be sure that the container matches the need of the plant you are growing. Deep soil containers for sweet peas? Sure, toilet paper rolls are popular on blogs, but I have never had luck with them, they fall apart too quickly, and although I used to promote deep root containers for sweet peas, I get fine results by sowing in 2-inch pots. Celery seedlings take a long time to mature, so early sowing (late January) is key. Grow cool under glass, and one could have heads of celery by mid July. Set out once the soil is warm in mid May and keep well watered and fertilized. I use what commercial growers use - PromixBX. I find nothing else that comes as close to this high-quality mix, and I stay away from 'seed-starting mixes' as I have yet to find one which isnt poor in quality. Soil for seeds must be sterile, clean and free from pathogens as seedlings, especially if grown indoors are succeptable to many soil borne diseases. I will admit that I am testing some of the newer peat-free mixes this year, I'll let you know how they work. Never use garden soil unless you can augment it with some organic matter and perlite. It's more about soil structure than anything else. If I had a soil sterilizer and the time and space to sift my compost in the winter months, I would use that more often (someday, I will), but for now, I have to rely on a few bales of a peat-based mix. I feel some guilt about it, but also believe that new alternatives will be coming soon. Also, I never, ever use coir. Honestly, I hate it. I've lost too many plants to this material, it is difficult to control. It dries out quickly, and once dry, is difficult to moisten again. Some brands have dangerous amounts of sodium in it which has destroyed a few crops of cyclamen and bulb seeds for me in the past, and overall, I just dont beleive is any less impactful to our environment than peat is as all coir is flown in. I do transplant my seedling into a mix of sterilized garden soil, composted wood bark and compost. i use perlite and sand as well, of course, it all depends on what I am growing. Soil blocks work very well for many I hear, but they can be difficult to master (compress with muscle!). I still want to try them. I did use a friends machine, but the blocks still fell apart too quickly for me - I think our hose water pressure is too strong in the greenhouse. In a cellar, under lights, maybe they work better. Some flower farms have great luck with them in hoop houses, I imagine that if set into a flat, they help in holding their shape. I personally use black square plastic pots which I buy by the case (2.5 inch and 3. 5 inch). They set neatly into flats, and I can use my space more wisely in the greenhouse. I wash them out and use them 2 or 3 times, as well as I do plug trays. I also re-use commercial 6 and 8 cell packs once or twice, but wash them well every autumn (well, ok - I don't really wash them in bleach and water, but I should so I'll say it!). Always label well - use waterproof plastic labels, and yes, label every pot. A Sharpie is your friend. Also, try to label every pot if you can. Sometimes I am lazy and write directly onto the pot. Plastic is best here for wood often rots or the ink runs. As a side note, also be careful of seed packets themselves, especially if you have the bad habit I sometimes have of tearing the seed packet or folding it and using it as a label. Some now have ink that runs (Johnny's Seeds does). It can be quite frustrating to set a seed packet on the potting bench, only to discover later that all the information on it is unreadable due to the ink running after it got wet.